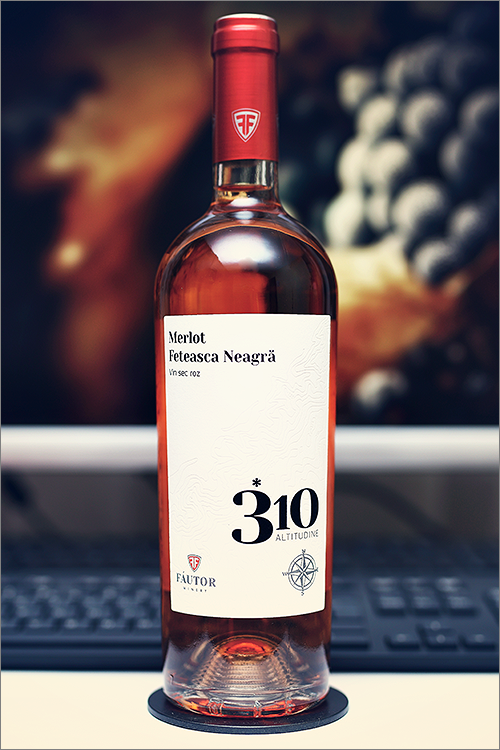 The wine we are going to review tonight is neither new nor old, as it was released on the market last summer, yet it is still relatively unnoticed by the wine lovers – *310 Altitudine Merlot – Feteasca Neagra 2016 from F’autor Winery. It is a rosé wine blend, made of 2 varieties: merlot, which adds body and structure and feteasca neagra, which is responsible for extra flavours and terrior – the local microsphere in the vineyard. This wine is part of the *310 Altitudine wine series that consists mainly of fresh, appealing and easy to drink wines that can be easily understood without too much fuss. That said, let’s find out just how good this wine is. Pale salmon pink color with shades of pastel rose towards the rim of the glass. The nose is strong, filled mostly with sweet berry fruit flavours: strawberry, raspberry, berberry, wolfberry, red delicious apple, red mirabelle, rose hips, strawberry jam and some subtle hints of watermelon. The wine is dry, with high alcohol level, high acidity and firm tannin. This is a crisp, bitter and a bit rough rosé wine, with a quite zesty and austere profile, as it tastes lean, fruity and angular towards the end. It has a fair overall balance and it feels fresh and a bit too green for a rosé wine. This is definitely a fine Wine of Moldova and the overall rating says the same, with 89.6 points scored it is right there, among the best wines we’ve tasted so far. Please click on the chart icon on the left in order to get to the wine rating page, where you can find all the wines we’ve tasted to date. Conclusion: this is a quite refreshing rosé wine, which is not yet in its peak form and it is difficult to predict if it can get there anytime soon, due to its angularity, which makes any further assumption difficult. Our recommendation is to drink it now, as long as it is still young and beautiful and not rely on the ageing variable. In order to smoothen its angles, pair this wine with any sweet-sauce based dishes, like for example a chinese plum & chicken stir fry or some salmon and cream cheese bruschetta. Enjoy!